RollerCoaster Tycoon World :: Post-Release Update #3 - Unity 5.4! Happy 2017! Today, we are proud to announce our latest update which we know you have been eagerly awaiting. Our latest update focuses on RCTW’s upgrade to Unity 5.4, bringing a host of upgrades and performance boosts that will benefit the game as a whole. Overall, Unity 5.4 should improve performance and user experience on lower-specced machines. Please note that specific results that you see will be dependent on your own PC setup. GPU Instancing - With this fix, you’ll see performance improvements with parks that feature multiple instances of the same PxP assets. Previously mesh combine would store the combined mesh and uncombined state of the object in memory and subsequently reduce performance, but this GPU instancing will replace the mesh combine Speed improvements have been most noticeable on lower end machines. Post Processing Stack - Unity 5.4 optimizes how the game creates and displays visual effects, resulting in increased frame rate performance. This should help parks for users that love FX Generators. Optimization of Ride Cameras – Parks with lots of rides in them may see slight FPS increases from ride cam optimizations. Main Menu Optimization - Overall navigation and UI transitions are smoother. Along with our upgrade to Unity 5.4, we’ve made a number of bug fixes. The full list of fixed issues is below. Thanks so much for playing RCTW! Camera: Following a Fame event peep out from the park will get the camera stuck outside the park. Camera: Activating Free camera makes the game hang. Camera: Peepcam doesn’t take Peep posture into consideration. Credits: Credits have been updated. General: Going to the park expansion crashes the game. General: Game hangs when loading a Luminous Isle sandbox/mission. General: Save/Load – Unable to load save due to NullRef about trash. General: Peeps can be observed in a souvenir holding animation when sitting on a bench or picnic table. Grid: When rotating a building, and activating the grid the building can snap back and be 1 degree off. Grid: The local 1x1 Grid has a broken snapping during the Coaster Builder when at non-90 degrees angles. Loading: Loading screen hangs for a few seconds on Atari splash screen during first launch. Missions: On Mission 1.3 – Title crashes while mass deleting rocks on first play through. Missions: Neglecting to hit [Show Me] for the Fame Event tutorial in Mission 1.2 will force the user to restart Mission if Fame Event completes. 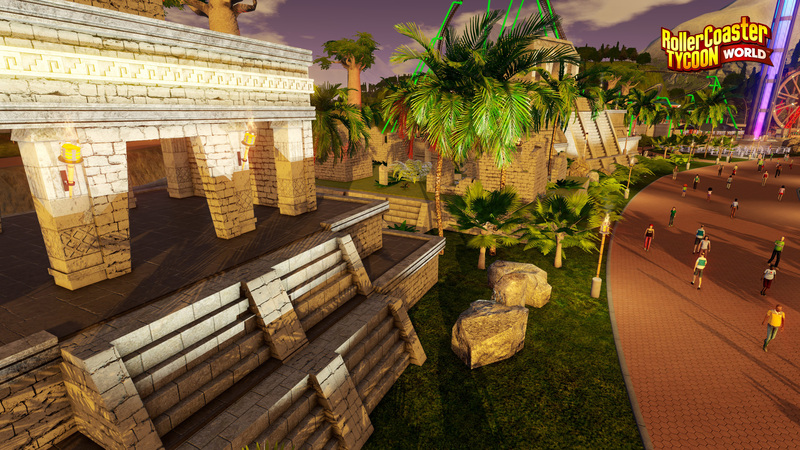 Missions: Mission 1.5 – Test stats are not calculated when in ride cam while testing the roller coaster for first time. Missions: Fame events – Sensitive Sam fame event fails when the park is clean. Objectives: Mission 1.7 – The first objective of ‘Think Big’ gets completed when clicking a peep. Options: Camera – The ‘Auto zoom out camera if object too large’ has no functionality in gameplay. Paths: Creating elevated paths has black flickering on the base pillar before placing it. PxP: Grid overlay when raising a piece is no longer transparent. PxP: The game crashes when placing a few PxP pieces down, using the trash can icon to delete those pieces and toggling the grid on and off. PxP: Placing a PxP pieces with grid activated and selecting a tile piece and deactivating the grid will lower the tile 1m. PxP: The grid flickers when placing any of the PxP premade except the western ones. PxP: PxP walls flicker when placed in the middle of 2 other walls. PxP: When player toggles grid on and off after placing a piece, it elevates to 4.2m. PxP: Whimsy – Placing the “Minatare Maze” or the “Floating Tower” premade PxP building makes the grid rotate. PxP: Individually selected pieces are rotated when toggling the grid on and off. PxP: The 4m Barrier aligns with the middle of grid squares instead of the border. PxP: Any extra PxP piece will flicker when placed on top of walls when overlapping. PxP: Placing a premade/blueprint, then placing any scenery, will cause the game to use the PxP grid rather than the Standard grid. PxP: The 4x4 Grid is broken in multiple situations. PxP: Some pieces overlap instead of stacking when perfectly aligned. Scenery: Certain plazas and 1 ride have black flickering textures. Scenery: The snow globe Center pieces’ globe is textured black. Scenery: The Lollipop flower scenery piece differs from the thumbnail picture. Scenery: Colored Queues – Color applies on the path even if the ‘Rails’ UI is active under the ‘COLORS’ tab. Terrain: Crash – Flattening terrain that has been lowered to the lowest level will crash the title. Terrain: Modify Terrain – The coasters supports levitate when the player ‘Flattens’ the terrain. UI/UX: Text strings in peeps thoughts tab are cut if park/ride name is too long. UI/UX: Starting missions that have broken rides have up scaled repair icons. UI/UX: [Spacebar] can be used to confirm menu selections which simultaneously pauses/resumes gameplay. My game won't play now. I load into my park and the game crashes! BRAND NEW PC!! 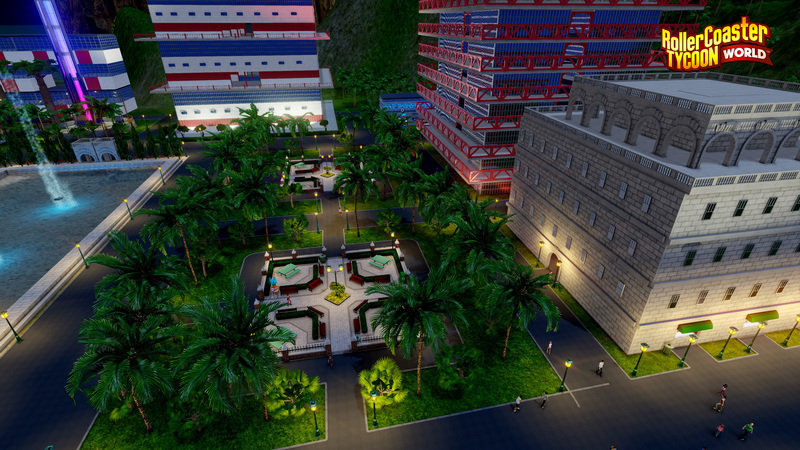 Addressed to P@Nn€K0eK: The game Cities: Skylines was also built on the Unity Engine, for example. The fact that a game has been built on a specific engine doesn't mean anything. damn wat a waste of my 10 bucks.... dint know they made it on unity engine. and the game keeps crashing. in about 1 day of play i lost all my interrest of the game and i would like my money to be refunded. I have been waiting for this game and am going to be waiting until the bug list has only an item or two. I love this game and since I deleted the existing app data and started the game over, I have been experiencing very positive results from this latest update except for the fact that PxP buldings are flashing. The game is still enjoyable,but the flashing takes away from the beauty. Lots of potential here.